Wrappers and Envelopes: Above or Below the Fold? As thrilling as the hunt is for exciting pieces, many folks are drawn to woodblock print collecting simply for the opportunity it offers to exercise the intellect. There is no end to new avenues to explore in the 350 year-history of ukiyo-e and shin-hanga, and one can always come up with a fresh point to debate, intriguing connections never before made, or a conundrum suddenly resolved. Moreover, thanks to Japanese print appreciation groups scattered here and there across the globe, and particularly their periodicals, amateur scholars can find a ready audience for their new discoveries and pet theories, sometimes provoking lively disagreements that continue on in print for decades. One of the joys of collecting Osaka prints is that the field is historically under-populated. Hence, the opportunity to make a solid contribution to scholarship is quadrupled at the same time as the chance that you will be immediately challenged in your views is more than halved. Furthermore, to increase still further the odds of not being contradicted, I tend to spotlight non-standard or novelty prints, items which even fewer folk study. However, even this strategy does not guarantee an existence free of sparring. A case in Point: Daruma 35 highlighted a genre of prints which I concluded were meant to be folded in three and used as gift wrappers or envelopes. In the article I mentioned a collecting acquaintance, who, based on one key example in his possession, was equally confident of a variant hypothesis; to wit, the three segments were intended to be cut up and placed, like souvenir postcards, inside another woodblock printed wrapper. The fact that all three pieces were supposed to be kept together explained (at least to his satisfaction) why the sheet sported but one signature and a single publisher's mark. Since Edo-period print publishers neglected to include dotted lines and tiny pictures of scissors, or, conversely, instructions for folding, the other man's conjecture seemed as legitimate as mine — except that the middle segments of these prints are always found printed upside down! To any reasonable human being, this would imply that folding the print was warranted, not cutting, and the matter would be closed. Well, as often happens in such cases, the fellow-collector has grown obstinate. He pointed out, condescendingly, that when separate blocks were used to print distinct segments on an ukiyo-e sheet, it made sense for the printer to line up edges with extensive use of color alongside each other, even if it meant one unit got turned upside-down. This disguised the unavoidable raggedness of both bleeding edges and produced an overall effect more pleasing to the eye. A telling point, indeed, but wait! The other day the gods were merciful and I found a three-segment, c. 1829 ôban print by the Osaka artist Nobukatsu (act. 1824-41). This print represents a crucial clue in my favor in that its middle portion, consisting of crests of individual actors and acting families, was indeed printed upside down but almost certainly not for the printer's sake. Had the salmon-colored wedge background simply been reversed, the edges could still be camouflaged and the crests would be pleasingly right side up. 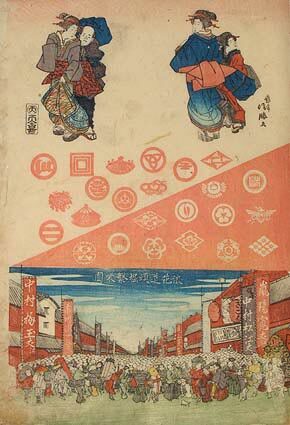 In other words, inverting the middle was unnecessary, unless folding was anticipated — a folding which, by the way, presumably left the 'flourishing activity' street scene of Osaka's Dôtonbori theater district featured on the front of the envelope, (note the banners with actor names and fan club signs); the crests displayed on the back (three concentric squares were for the Ichikawa family, two horizontal bars in a circle the Kataoka clan, etc. ); and the two charming courtesans, accompanied by attendants, tucked away protectively on the inside flap. I have to admit that the wide space between the ladies looks unnatural and leaves the door open for other theories as to how this print was supposed to be manipulated. My only solace is that, parry and thrust, there is certainly no indication that scissors were anticipated! This article originally appeared in Daruma, no. 38, Spring 2003. Copyrighted © text and pictures reprinted with permission.